You are sitting on your wide comfy couch, you spread your legs and place them on the table. GET YOUR FEET OFF THE TABLE! OK you do not place them on the table.. You are getting ready for a movie night with your significant other. Let’s prepare everything the way they should be. It’s a Star Wars movie marathon. You turn on your 52” screen, prepare the twelve Dolby digital speakers in each corner of the living room, turn off the lights to create the ideal atmosphere and grab from the fridge the biggest soda cup mankind has ever created. However, there is something missing. Something which makes every movie unique when you go to the movie theaters. For some of us it is also the reason why we sometimes go to watch a movie at the cinema. And the answer is yes, this something is indeed the mouthwatering buttery popcorn. But it wouldn’t be the same if you just make some popcorn in a pot. After all, you really want the cinema experience. Worry no more! If you won’t go to the cinema, the cinema must come to you. Nostalgia Electrics (yes that’s a cool name which says it all) came up with the fantastic idea of building this retro style kettle popcorn maker. It looks amazing and brings the popcorn cinema experience right at your home. This Pop Corn Kernel features a large, stainless steel kettle with a built-in stirring system and pops up to 10 cups of popcorn per batch. You don’t have to worry about messing up a recipe either, since it comes together with a measuring spoon for oil as well as a measuring cup for popcorn kernels, so that every batch is the same. Everything you need for unlimited amount of popcorn to get the movie night rolling. 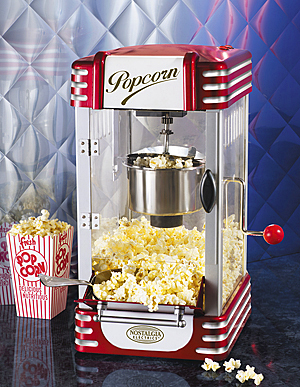 It’s time to have the movie theater feeling with this magnificent popcorn maker. You have everything you need for an amazing movie night from beginning till the end with short breaks in between for more popcorn. That’s OK, you’re at home.